T-Series and Percept Picture Company, two of the biggest banners in Bollywood, have tied-up for a mega five-film deal. 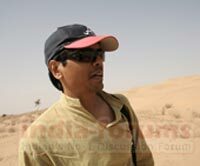 Nagesh Kukunoor's "Aashayein", which is currently under production and stars John Abraham, will be a part of this deal. The second film, tentatively titled "Tasveer", will again be directed by Nagesh Kukunoor and will star Akshay Kumar and Ayesha Takia in the lead. The third is a Tamil film titled "Kanjivaram" which will be directed by Priyadarshan, who will also be making the fourth film with Akshay Kumar. The fifth and last film of the deal will be "Malamaal Weekly 2", a sequel to the comedy released last year. The star cast of the film will include Paresh Rawal, Rajpal Yadav and others from the original film.